But stop your complaining. I think we need a term that indicates the stuff smaller than flash fiction, the under 50 stories or under 100 word stories. And I also think we need a term for that space between a short story and a proper novella. So there you have it. Want to argue with me? I eagerly await your insights in the comments. Mind the Gaps: I really don’t think the skull and crossbones is an exaggeration if you’re writing fiction that doesn’t fall inside these parameters. I mean, it’s hard enough to place a novella somewhere, but even harder to find something that doesn’t fall inside these word lengths. It’s the kiss of death. Oprah has a great list of micro-fictions under 300 words, with authors like A.M Homes and Anna Deavere Smith. For flash fiction, check out the literary journal Flash Fiction Online, or my list of the Best 20 Flash Fiction Journals. Nouvella is probably the best place to find good examples of novellas (tag line: “Don’t be a Lengthist,”) and also look at my list of the Best Publishers for novellas. Novelette is a weird category. Some people who are publishing novellas are really looking for both novelettes and novellas, but a good chunk of publishers (especially those releasing stand-alone books) are looking for proper novellas, none of this 12k word length. 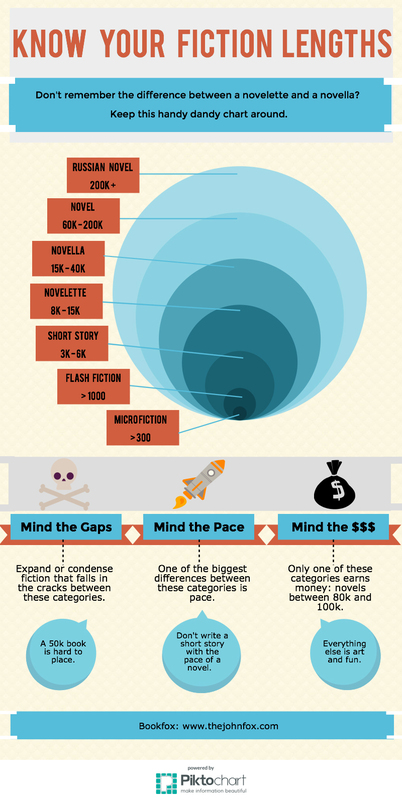 I could have skipped it and just labelled it under the umbrella of novella, but I think it’s helpful to realize that stuff under 15k or 20k is probably better for an online publisher or for a literary journal or chapbook than for a publisher looking for proper novellas. Think about other recent examples. The 4-tome series (which is really just one book) by Elena Ferrante called The Neapolitan novels. Or check out Karl Ove Knausgaard’s gigantic “My Struggle,” which is really one book split into many books. If these series weren’t split into multiple books for marketing reasons, we would have even more examples of books that surpass the 1000+ word mark. Some people have called this the Very Long Novel. (VLN). I think we can do better than that. The Doorstopper Novel? The Epic Novel? The Hole-Up-For-Two-Weeks novel? Russian Novel is my tongue-in-cheek way of approaching it. I mean, Tolstoy’s “War and Peace” is 1300 pages and Dostoevsky’s “Brothers Karamazov” is over 800 pages (depending on translations, obviously). They kind of pioneered the whole long novel shindig. Thanks! Your infographic is really helpful.